Wangan Midnight Maximum Tune 3DX Plus is an updated version of Namco's racing title with additional cars, a new track, and extra customisation options to increase the fun and excitement. 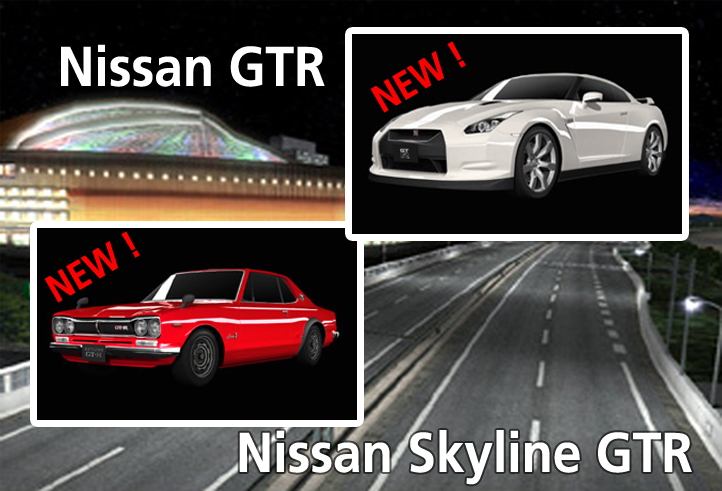 Cars available in this version are the Nissan GTR(RR35) and the legendary Nissan Skyline GTR(KPGC10). 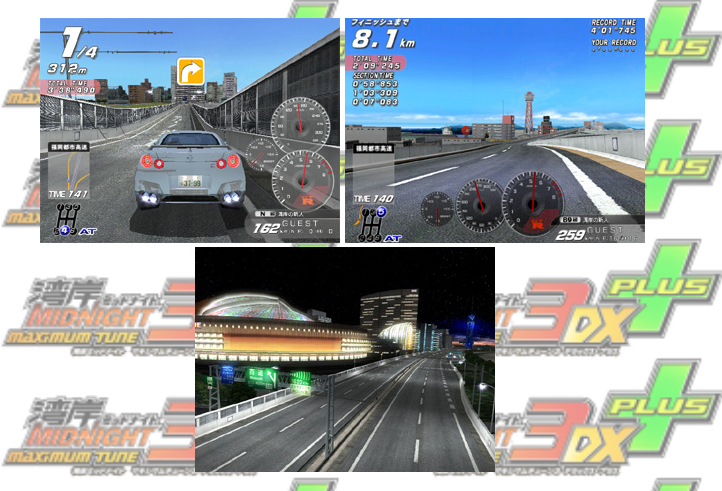 "Fukuoka urban expressway" will appear in Wangan Midnight Maximum Tune 3DX Plus . Finally won the four major cities fast!Up Down and unprecedented form of courses and other courses are filled with different attractions.Interest was also track changes in the background by the difference between the early morning and late night hours, in the early morning hours a deaf ear to the blue sea spread across the road, in the late night hours to run things, but watching the glittering city of Fukuoka can. the car more distinctive by the addition of new wheels. © Michiharu Kusunoki/ Kodansha Ltd. All rights reserved. Based on original comics "Wangan Midnight" created by Michiharu Kusunoki, serialized in Kodansha "Young Magazine" since 1992. © 2003 - 2008 NAMCO BANDAI Games Inc. All trademarks and copyright associated with the manufacturers, cars, models, trade names brands and visual images depicted in this game are the property of their respectively owners. All rights reserved. INITIAL D ARCADE STAGE 5 hits Virtualand! Like its predecessors, ARCADE STAGE 5 is a street racing game themed around the INITIAL D manga. Joining the modes of play from past titles is the new "Hashiriya Event Mode," where players race under set regulations. Five cars, including the Lancer Evolution VII and the MR-S, have been added to the game, along with a new course set in Nagano and the return of the the Happougahara course from part 3 of the series. BRAND NEW CARS, COURSES & MODES!!! TKA Amusement proudly presents OUTRUN 2 SP SUPER DELUXE™. OUTRUN 2 SP SUPER DELUXE™ is the latest sequel to the coin-op classics OutRun™ and OutRun 2 SP™. The attraction cabinet is a virtual driving experience combining the exhilaration of a FERRARI joy ride with LINDBERGH's™ graphics on four big screen simulators. One unique aspect of the game is the ability to play as teams, with alternating driver control within each car! The cabinets are designed to look like a red Ferrari F50, a yellow Dino 246 GT, a blue 360 Spider, and silver 512 BB. Cabinet movement is achieved through two powerful electric motors and responds to the driver’s reactions as well as impacts, collisions, and road surfaces. Each simulator comes loaded with two sets of steering wheels, accelerators, and breaks for a team style of playing. In team play mode, the drivers switch control when the car comes in contact with other cars, walls, or at the check points. The dynamic style of play is spontaneous, heart-pumping, and flat out fun. Driving in OUTRUN 2 SP SUPER DELUXE™ is fast, lifelike, and exhilarating especially with its drifting techniques and metropolitan/mountain courses. Come on! Experience it yourself! Produced under license of Ferrari Spa. FERRARI, the PRANCING HORSE device, all associated logos and distinctive designs are trademarks of Ferrari Spa. he body designs of the Ferrari cars are protected as Ferrari property under design, trademark and trade dress regulations. HERE comes Mario & Gang in a slightly different manner!! One of the most eagerly awaited arcade games of modern times; MARIO KART ARCADE GP 2 features 32 variations of courses across eight different worlds and is a phenomenon that comes complete with a ready-made fan base. 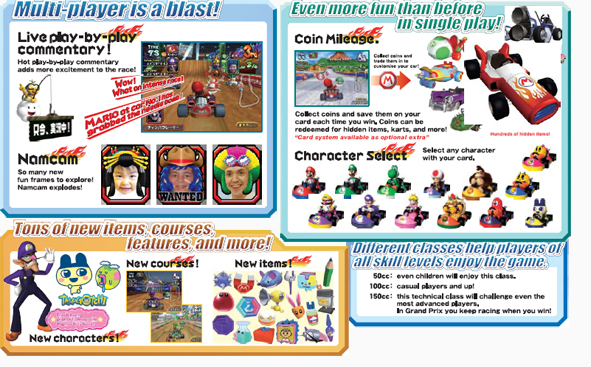 MK2 features new characters from Bandai, including Tamagotchi, live in-race commentary and is available with optional re-writable card-playing system. Plus, MK2 features a camera above the monitor, known as a 'Nam Cam' which projects the player’s face onto the screen as their chosen character. For example, players who select Mario will appear wearing the iconic red hat and moustache. As much fun for novice as expert, MK2 represents the most versatile driving game and is linkable for up to four players. 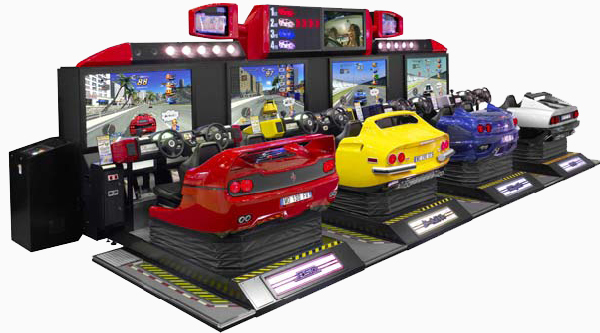 The version of the game on display let you take your racer into one of two modes: time attack or grand prix. The time attack mode is exactly what you'd expect, an all-out race against the clock for the best score on a particular course. The grand prix mode pit you against other racers in a no-holds-barred throwdown for first place. All told, MK2 is looking like a sharp arcade racer with an abundance of charm. LET'S RACE! 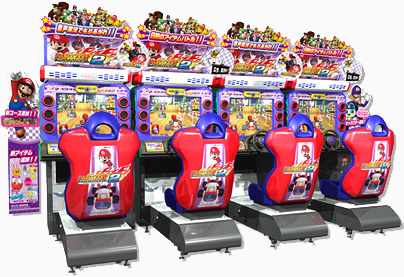 Is there any release date on when our current initial d machines will be upgraded to ver2.0? Tentatively, we would not be upgrading to ver 2. But we will feedback your suggestion to the management.